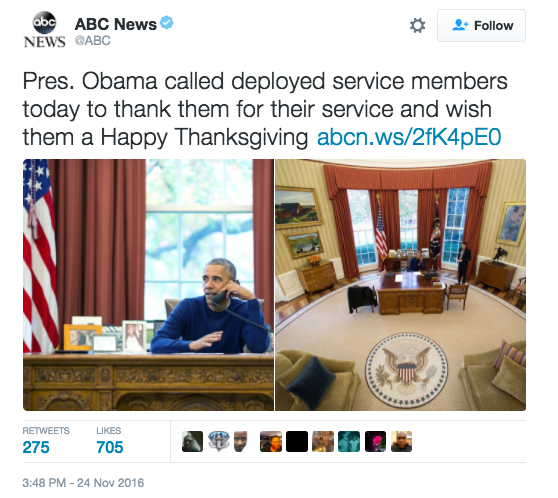 On Thursday, President Barack Obama and Defense Secretary Ash Carter made phone calls to several service members to wish them a Happy Thanksgiving. The two leaders individually called active military members who were stationed around the world taking part in various operations. Obama called nine service members and Carter called four service members and one military spouse. — Army National Guard Staff Sergeant Edward Roseman, 33, of Coconut Creek, Florida. Roseman is serving in the U.S. Africa Command area of responsibility.As a platoon sergeant, his efforts have been vital to the success of more than 300 security missions. — Marine Corps Staff Sergeant Mitchell Lander, 30, of Irwin, Pennsylvania.Lander provides imagery analysis in support of operations in the U.S. Central Command area of responsibility. — Navy Reservist Lieutenant Kyle Fitzpatrick, 33, of Philadelphia, Pennsylvania.Fitzpatrick is supporting Operation Inherent Resolve in the U.S. Central Command area of responsibility. — Air Force Airman First Class Jake Pullen, 19, of Kenosha, Wisconsin. Pullen is deployed to the U.S. Central Command area of responsibility where he supports Operation Silent Sentry. The release added that in addition, Carter and his wife, Stephanie, called an Army Spouse named Blessing Gallo who volunteers and mentors other spouses through the stress of deployment. “Carter said he was very grateful for the opportunity to speak to these extraordinary individuals who are serving their nation and asked that they pass on his best wishes to their colleagues and families as well,” the statement said. Carter also released a video to all military members wishing them and their families a happy Thanksgiving.